Japanese camera and medical equipment maker Olympus and its UK subsidiary Gyrus Group will be prosecuted by the UK's Serious Fraud Office. They have been charged with providing "misleading, false or deceptive" material in accounts for Gyrus Group. Olympus's acquisition of Gyrus was one of the deals called into question as a $1.7bn (£1.1bn) accounting scandal at the Japanese firm unfolded in 2011. Three former executives have been given suspended jail terms over the affair. Former chairman Tsuyoshi Kikukawa and executives Hisashi Mori and Hideo Yamada were sentenced for their role, after pleading guilty last year to charges of falsifying accounts to cover up losses of $1.7bn. It is one of the biggest financial frauds in Japan's history and came to light when the-then chief executive Michael Woodford was dismissed from his post after challenging Mr Kikukawa and the board over suspiciously large payments related to acquisitions. The purchase of Gyrus was one of the deals that Mr Woodford raised questions about. He had claimed that he was fired for raising the issue and had contacted the UK's Serious Fraud Office (SFO) about the Japanese firm's accounting practices. 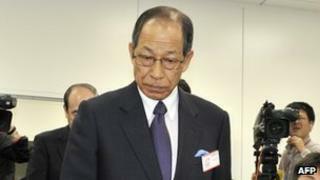 That led to an investigation being launched in Japan, which revealed a cover-up of losses dating back to the 1990s. Earlier this year, a Japanese court ordered Olympus to pay 700m yen ($7m; £4.5m) in fines. The SFO has also been conducting its own investigation into the matter. On Wednesday, Olympus said that "it is difficult to predict the outcome of this matter or estimate the level of fines that may be imposed on the company and Gyrus Group Limited," by the SFO probe. It said that as a result, "the potential financial impact of this prosecution on Olympus group's business is unclear".